One of my family members who spends a lot of time exercising outdoors recently told me about an important fitness “accessory” for people who walk, run, bike, swim, hike or just like to spend time outdoors. It is called Road ID. Some folks write their name and phone number in their running shorts, or, like me, carry a copy of their driver’s license with them when exercising outdoors. In case of an emergency, this only tells first responders your name, phone number and/or address. But with Road ID, first responders have access to important, and even life-saving information. 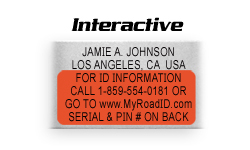 Road ID describes itself as “personal identification gear”. Think of it as a modern ID bracelet, but with a twist. There are two versions – Original and Interactive. The Original version (shown above) allows you to custom engrave 6-7 lines of information such as your name, address and emergency contact names and phone numbers. But the cool factor comes in with the Interactive version The Interactive version also lets you custom engrave information, but it includes a Serial number and PIN that allows first responders to access your health information and your emergency contact information through a secure web site or phone number. With the Interactive version you can update your Emergency Response Profile as often as you like. There is a charge of $9.99 per year for this service, but the first year is free. A small price to pay for peace of mind. This would have come in handy for a friend of mine who tripped while jogging, hit her head on the pavement and knocked herself out. Fortunately, she regained consciousness in a few minutes, but had that not happened the paramedics would have been able to contact her family and her doctor, and determine if she had any medical conditions and/or allergies and what medication she was taking. You can check out the Road ID web site for testimonials from some of their customers. Road ID comes in several different colors and styles ranging from bracelets and dog tags to anklets and shoe pouches. The ID plates are interchangeable so you can order different band colors and switch out the plate. Plus, Road ID donates a portion of the proceeds from every order to one of nine charities – you can take your pick. I ordered the Interactive Wrist Elite ID in black. I hope I never need it, but I feel safer knowing that I have it. As a KeepWell vendor and volunteer emergency medical technician, I’d like to emphasize how important it is for first responders to know medical information about our patients who cannot speak to us. We need to know not only your name, age, and contact information, but also any chronic conditions such as diabetes or heart conditions. Your medication list is also vital but even more critical to your treatment is knowing any allergies to medication. Something that saves one person can be life-threatening to someone else. Help us help you.